Makeup is a beautiful thing. It can be used to create a look that you love, that you feel comfortable in. It can be used to highlight different features, make your eyes pop, add life to dull skin, and so much more. We love makeup, from mascara and eyeliner to highlight and blush. Learning different makeup techniques can be exciting and finally mastering the perfect eyeliner wing can make your entire week better. Some people spend more money on their makeup than they do on food, that is some serious commitment and just proves how much makeup means to some people. But there is a downside of makeup, and we are not just talking about those few nights a month you forget to wash it all off before bed. Makeup may have the potential to cause us harm, with ingredients and properties that may affect the health of our skin and more. Taking a peek at the ingredients in your favorite products can help you be more aware of what you are putting on your body. We aren’t telling you to stop using makeup immediately but we do want you to be aware of what your makeup could be doing and why it is so important to clean it off well before bed each night. This is another reason why it is so important to care for your skin, because wearing makeup during the day may be causing more problems than you think. At Azeal Dermatology Institute, we work hard to make sure you get the best skin care services and treatments possible. Our Boulder dermatology institute can help you better care for your skin, addressing any skin concerns you may have, and allow you to get the care you need. Today, we are going to talk about something you do daily and how it could be affecting your skin. Read on to learn more! We know you don’t want to, but it may help keep your skin healthier and looking better. This may be obvious but makeup has a tendency to clog pores. An article from Bustle mentions that oil-based and long-wear makeup are more likely to clog pores than water-based makeups. Long-wear makeup may stay on your face throughout your entire busy day, but it also has a chance to soak deeper into your skin and is more difficult to remove. Another article from The Express Tribune, also discusses oil-based makeups, saying that they may end up causing acne, allergies, and blackheads. Oil-based makeup is even worse when you have oily skin. This doesn’t mean you should use oil-based makeup on dry skin either. Maybe just don’t use oil-based or long wear makeup on a daily basis, this can help you to avoid your pores being clogged day after day. If you have sensitive skin, checking the ingredients on your makeup can help you to avoid irritations and breakouts, but the Bustle article mentions that the ingredients in skincare and beauty products are not well regulated in the US like they are in other countries, like Europe and Asia. This makes is more important to check the labels on your makeup for ingredients that may cause you problems. It is always a good idea to spot test first by trying a small amount of a product on the inside of your wrist before applying it to your face. Remember, it is better to be safe than sorry. Some beauty products with fragrances or preservatives could cause some people to experience an allergic reaction. This reaction could include hives or even excessive sneezing. It is best to avoid these products if you have problems with fragrances or smell it before applying it to your face. Allergic reactions are never fun and when they happen on your face, applying more makeup to cover it up could just make it worse. You should always take caution when you put makeup close to your eye. Glitter and eyeliner in your waterline could cause eye problems, which no one wants! When you put eyeliner in your waterline, it becomes easier for particles to get into your eye, which could end up causing infections or harm to your eye. 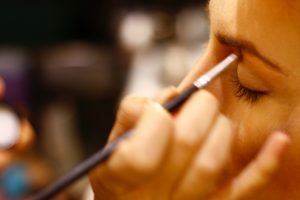 The Bustle article mentions that one way to try and avoid this while still wearing your favorite eye makeup is to make sure to sharpen or sanitize your pencil before each use. You also want to be sure to keep expirations dates in mind when it comes to your eye makeup. Makeup does age, and when you apply moldy makeup close to your eyes it has to potential to cause serious problems, including losing your eye. There are many other issues that can stem from makeup including headaches, respiratory issues, and other internal issues, but we think we have scared you enough for one day. 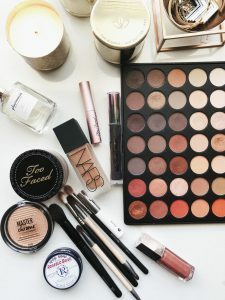 We did not put this blog out there to get you to stop wearing makeup, we simply want you to be aware of problems that could be caused by these beauty products. Makeup is fun and many of us love it, these concerns and health issues do not mean you need to stop wearing makeup, just be aware. If you take time to read the ingredients in your makeup, fully wash your makeup off your face every night, and take any other precaution, you will be fine. But if you do happen to notice a few issues or you have other skin concerns, schedule an appointment with Azeal Dermatology Institute. We can help determine what is causing problems on your skin, give you tips on how to better care for your skin, and help with any other skin problems you need solved. Remember, this does not mean you have to stop wearing makeup, but be more aware of what you are putting on your face! Contact us today with any questions you may have.